Adam Peaty broke his own world record to defend his 100m Breaststroke title at the 2018 European Championships in Glasgow. The Olympic champion took the world marker down to 57.10 as he powered ahead of a world class field at Tollcross. James Wilby ensured a British and English one-two on the podium as he broke 59 seconds for the first time, claiming silver on 58.64. But while Wilby’s effort elevated him to the joint fourth fastest man in history, there was no keeping with the defending champion as he forged clear. Peaty has been in dominant form since the very first session in Glasgow, where he broke his own Championship 100m Breaststroke record in the heats. The English swimmer saw his international dominance upset earlier this season, settling for silver behind Cameron van der Burgh in the 50m Breast at April’s Commonwealth Games. But there was no doubting Peaty’s return to form in Scotland, as he knocked 0.13 seconds off his world record from Rio 2016 and edged ever closer to the coveted 56 second effort for 100m Breast. “Oh my god, I cannot believe that,” said Peaty, who landed his third consecutive European 100m Breast crown with gold. “This journey I’ve been on for the last four years has been incredible. “To go one-two shows that Team GB aren’t resting in between the quad. We’re pushing and pushing and we’re having fun along the way. “Sometimes you’ve got to have a bad race to realise how much you love the sport and how much it means to you. “I keep saying it, but at Commies I learnt a big lesson. I was too tense and it just wasn’t me. 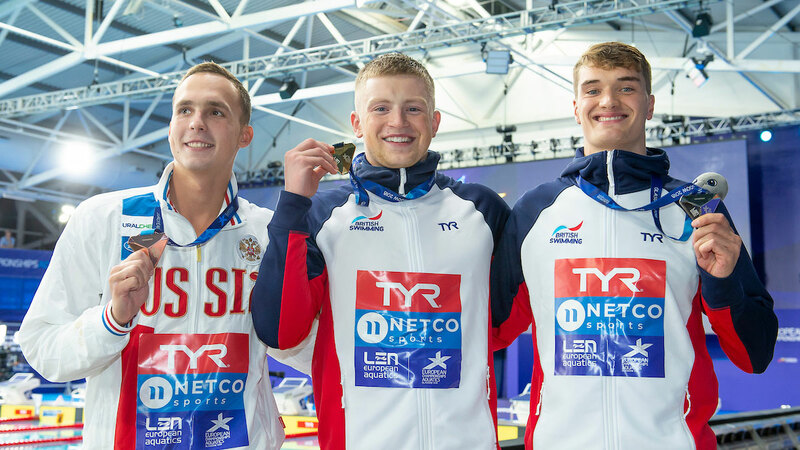 Wilby’s silver saw a repeat of the result from the Gold Coast, and handed the 24-year old Loughborough swimmer his first senior European medal. “I’m pretty happy with that,” said Wilby, who won the Commonwealth title over 200m Breaststroke. “I heard the crowd going mental, looked up, and saw Adam’s time. But then I saw my time and yeah, I’m really happy with that. Freya Anderson became the third English medallist of the night as she anchored home the British Mixed 4x200m Freestyle Relay quartet to bronze. The 17-year old Ellesmere College Titans swimmer clocked the fastest 200m of all the women in the final, splitting 1:55.80. Scotland’s Stephen Milne and Craig McLean swam the first two legs for GB, before Welsh swimmer Kathryn Greenslade took on the third leg. But with the Brits lying sixth as she dived in, Anderson clawed her way back past the field, bringing them home in 7:29.72. Germany won gold in a Championship record 7:28.43, while Russia were less than half a second ahead of the Brits on 7:29.37. Two of Great Britain’s Rio 2016 Olympic medallists also shone on the night as Siobhan-Marie O’Connor and James Guy booked final berths. O’Connor, an Olympic and World Championship medallist over 200m Individual Medley, won her 100m Breaststroke semi-final to qualify second fastest overall. The British record holder stopped the clock on 1:06.89, progressing behind Russia’s triple Olympic medallist Yuliya Efimova (1:05.77). English swimmer Imogen Clark was 13th overall after clocking 1:08.26 from lane one in the second semi. Meanwhile, Guy – who won two relay silvers in Rio – was fourth fastest overall in the men’s 200m Butterfly, touching in 1:56.06.